I’m a real mom. I’m not a pinterest queen, I’m no chef, and I’m not a health nut. I just try my best to hold down the home front. Some days I feel like a domestic goddess other days I feel like I'm just surviving staying at home. I love easy meals, I'm not much of a cook. I do hate packaged meals so when there is a need for an easy meal, its got to be at least semi homemade. I like to make the sauce ahead of time and put it in the freezer. Fridays are always so busy with dance class after school that dinner has to be made quickly. I take out the sauce before Morrigan gets off the school bus and it defrosts while we are at dance. I throw on some water when we get back, put in the pasta after the water boils for 9 minutes. I put the sauce in a sauce pan and heat it up. I love those Perdue Short Cuts Italian flavored chicken strips. I heat those up in the microwave. Also, Morrigan loves broccoli so I heat up frozen spears in my Pampered Chef Microwave Steamer (if you don't have one of these, go buy one, now!) In some water for 4 minutes. 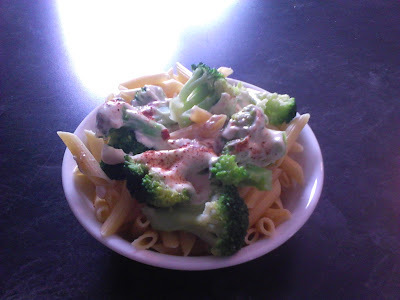 I bowl the pasta, throw on top the broccoli and the chicken, pour the sauce on top, sprinkle some parmesan cheese and nutmeg and you have yourself a quick and easy dinner that should of taken you a lot more time and effort. Just cut up the cream cheese into cubes and throw into a sauce pan. Cut up butter as well. Add the parmesan, milk, butter, pepper, and garlic powder and heat it on low until all is melted. You got yourself an Alfredo sauce, it's that easy! You can put the sauce in either a plastic container or just in a freezer bag and freeze it to be used later. I also like to freeze them into cubes in a ice cube tray for easy single servings. I eat Alfredo with pasta for lunch sometimes. To change it up, I also heat up some carrots and peas in with the broccoli and leave out the chicken as a quick lunch. 9 minutes to prepare the pasta and I have an awesome lunch. Its as easy as making a box of Mac and cheese. Give it a try, play round with it. I wouldn't mind seeing what a little parsley and/or cayenne pepper might taste like in this sauce.